We are still in the process of taking our photos today but we wanted to post a quick picture of Lucilla Grimlock. Isn't she beautiful! We hope you like what you see and we will be sure to post more pictures and video from todays photo shoot as soon as we are done. This Sunday we will be doing our first photo shoot for Grimlock Manor! We hope to take a ton of pictures of our characters and some of our scenes for the website which we are just super excited about getting up! 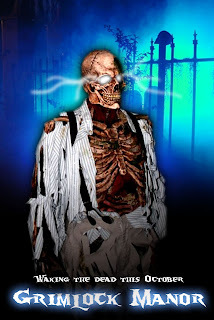 Some of our photos will include our main character Griswald Grimlock, Lucilla Grimlock, The Beast and our butler Bosley along with a few of our other ghouls. The scenes we have set in mind for the shoot are Lucillas room, The Study and some of our dark corridors throughout the Manor. We are really excited to share our progress with you and hope that you will enjoy the pictures upon their completion. We will be sure to post an update as soon as the site is live and we hope you will check it out and share your thoughts with us. We wanted to thank everyone who came out to support us last night at the Metuchen Main Street Classic Car Cruise Night. We had a great response from the crowd and were able to hand out about 500+ flyers. The next Cruise Night is September 2nd so you can meet us there again only next time we will have a few characters in costume to hand out candy to the kids and take some photos with those who are daring enough! 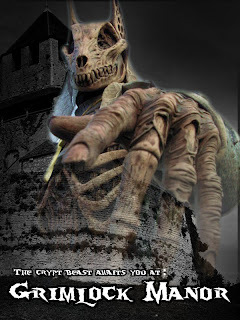 Please stay tuned for more updates and events and the unveiling of the new Grimlockmanor.com this weekend! Here is our first web banner. If you have a website and would like like to trade links with us then please email us. We would love to trade our banner with you! Classic Car Cruise Night Tonight! We are about to head out to our first promotional event for Grimlock Manor! We will be on Main Street in Metuchen NJ tonight from 6:15PM until 9PM handing out our flyers and doing a little face painting for the kids. If you are free than please swing by and say hello. Besides grabbing our cool flyers you can also grab a few pictures of some the awesome classic cars that will be lining the street for show, it should be fun! We will be sure to post some pictures from the event tomorrow. Remember while your here on the blog to sign up to be a fan because the first 300 people will be entered to win an iPod shuffle!!! Please be sure to tell your friends and family too! New Character Photos Are Here! We have been getting in some of our costumes & costume pieces so we started putting everything together in order to start making some promo images for our website. We hope you enjoy the pictures and we hope to be bringing you some more soon!